A strudel is a type of layered pastry with a — most often sweet — filling inside, often served with cream. It became well known and gained popularity in the 18th century through the Habsburg Empire. 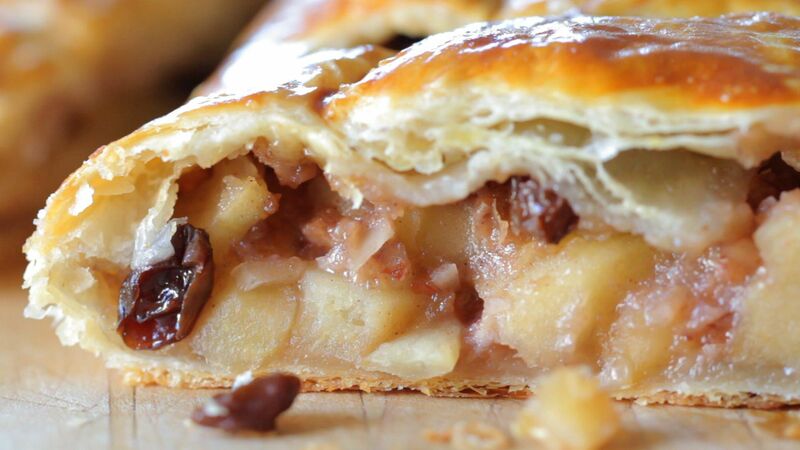 Strudel is most often associated with Austrian cuisine but is also a traditional pastry in the whole area formerly belonging to the Austro-Hungarian empire. The oldest Strudel recipe (a Millirahmstrudel) is from 1696, a handwritten recipe at the Viennese City Library, Wiener Stadtbibliothek. The pastry has its origins in the similar Byzantine Empire or Middle Eastern pastries. Strudel is a loanword in English from German. The word itself derives from the German word Strudel, which in Middle High German literally means “whirlpool” or “eddy”. In Hungary it is known as rétes, in Bosnia and Herzegovina, Croatia and Serbia as štrudla or savijača, in Slovenia as štrudelj or zavitek, in the Czech Republic as závin or štrúdl, in Romania as ștrudel, and in Slovakia as štrúdľa or závin. 1239 King Edward I of England was born (ruled 1272-1307). His coronation feast included 278 bacon hogs, 450 pigs, 440 oxen, 430 sheep and 22,600 hens and capons. 1862 W.H. Fancher and C.M. French patented an unusual plow/gun combination. 1870 George Cormack, the creator of Wheaties cereal, was born. 1872 George M. Hoover arrived in Dodge City. He was the second settler there, and opened the first business, a saloon of course. Whisky was 25 cents. 1903 Ruth Graves Wakefield was born. Inventor of the Toll House Cookie, the first chocolate chip cookie, at the Toll House Inn neart Whitman, Massachusetts in the 1930s. 1978 ‘Cheeseburger In Paradise’ by Jimmy Buffett peaks at #32 on the charts. I love strudel. Had no clue people were making it in 1696!